I was asked by Gregg to make an Alice in Wonderland birthday cake for Mae’s 40th unbirthday party. This was to be my biggest cake yet and an all new challenge. I had dabbled a wee bit with fondant figures but not to the point that I would be making enough accents for cake. I was nervous and excited. I spent hours and days looking at ideas and videos online. I studied all about structure and support of cakes. 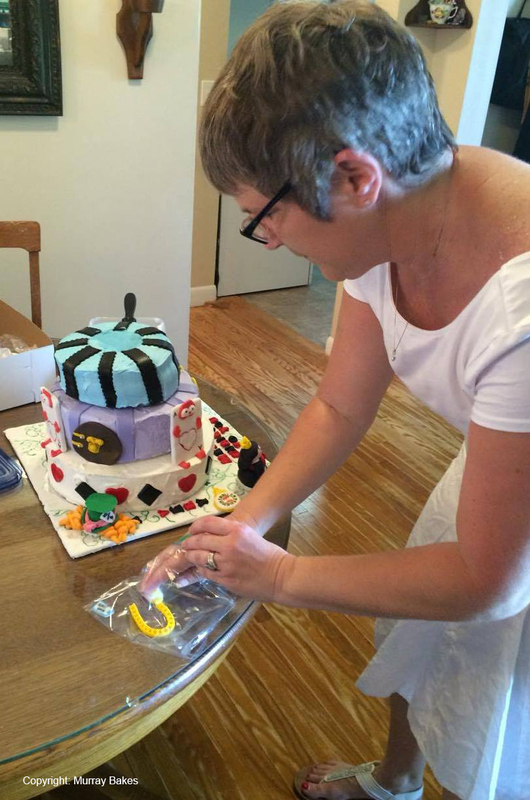 Almost three weeks of making fondant accessories and a detailed decorated cake board, I still envision the red curls of the made hatter, the playing cards, the rabbit and a “little Tykes” shaped queen… and all of the little details. In the end, the cake was a three tiered cake: Chocolate cake filled with ganache and salted caramel. homemade fondant (Liz Marek fondant recipe) and Swiss meringue buttercream. The day of the birthday arrives and I must now transport the creation to the party, taking the Via Rail ( like Amtrak). This is just over 1 :40 travel time by train, then a friend would meet me at the other end to drive me. Needless to say I had the three tiers boxed individually, all of the accents carefully packaged in a box with bubble wrap. I had an emergency kit prepared with icing, spatula etc…. anything I may need to build and or repair. The day of the party was incredibly hot. 40 degrees Celsius!!! I was so afraid the buttercream and fillings would not fair well. I arrived at the party and promptly put the cakes in the fridge until assembly time. I was able to “relax” for a while taking in all of the amazing decorations and costumes of this themed party, be with friends and have a cold drink…the whole time…thinking of the cake…what ifs and back up plans. My friend and her husband made my white rabbit costume, loved it. Finally took the time to assemble the cake. As I took the cakes out of the boxes, and realized that for the most part, they traveled well, I then started to relax. Two friends were in the dining area watching and helping me assemble the cake. I was now excited as it started to come together as I had planned. Now time for the grand reveal in the backyard for the Unbirthday Girl…..Did I mention 40 Degree weather? We carried this heavy beast carefully out to the backyard..once again, I cant breathe…”please don’t drop this cake, I hope Mae and Gregg like it…” so many thoughts but damn it…concentrate…don’t drop the bloody cake! The icing on the cake started to melt a little and the salted caramel layer started to slide. lol! Cake was a hit, yummy, moist and most importantly…loved by the Unbirthday Girl. I loved the expressions of the children at the party. they loved all of the accents, Mae took took the teacup with Alice and put it away, people seemed to like the cake. It seemed that for me, this was indeed a masterpiece! See the photos below of the assembly process and the final product.